The Romans are back at Twerton Park on Saturday for the penultimate home game of the season! 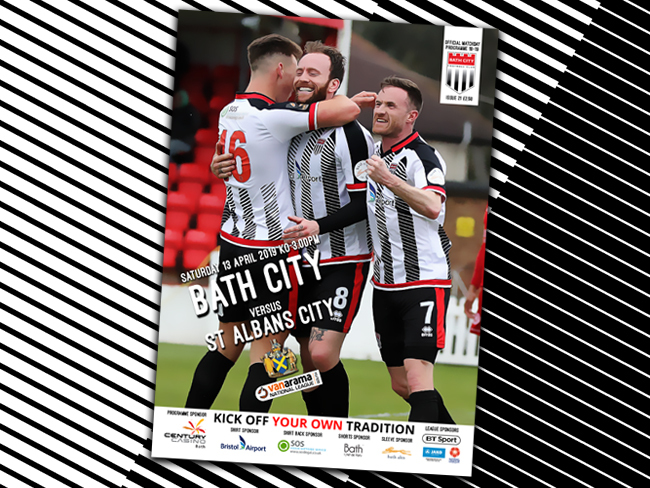 Two play-off hopefuls do battle in the Vanarama National League South as City take on St Albans on home soil. Kick off – 3pm! 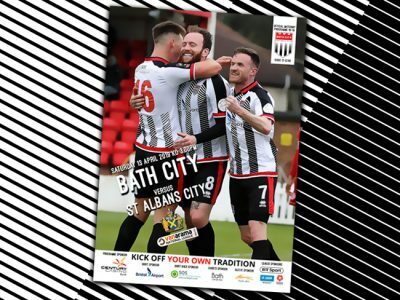 This weekend St Albans City are the visitors to Twerton Park and they themselves look to feature in the play-offs at the end of the season. The Hertfordshire side currently sit in 10th position in the table but are just two points behind Wealdstone in seventh. Ian Allinson’s Saints have picked up three wins, five draws and two losses in their last ten games and will be high on confidence after beating a strong Chelmsford City outfit on Saturday. A brace from David Moyo and a sublime chip from Khale Da Costa earned St Albans all three points and they’ll be looking to replicate that performance when they travel to Twerton on Saturday. The Romans have turned Twerton Park into a fortress over the past few months and are unbeaten in nine; a run which includes games over high-flying Torquay, Woking and Chelmsford. City fans have turned up in numbers during this superb run with the average attendance over the nine games being a magnificent 1350! We need that fantastic vocal support to continue on Saturday as we edge closer and closer to the end of the season so bring family and friends, get behind the boys and enjoy the game! Admission : £13 Adults, £10 Concessions, £7 Students, £2 U16s & £25 Family. Car Parking : If you are parking at Twerton Park be sure to arrive early as spaces are limited. Our overflow car parking WILL be available and can be found at: Curo, The Maltings, River Place, Lower Bristol Road, BA2 1EP. £2 per car and the gates close at 6:15pm. Half Time : Bath City Youth Girls will be playing mini-matches on the pitch at the interval and we’ll also be joined by the girls team from WASPS who made it to the finals of the National League Tournament. They will be presented with their medals and will do a lap of honour! Easter Treat : There are 150 FREE Easter biscuits up for grabs, kindly donated by Bakers of Bath. Head to Charlie’s Bar to pick up yours while they last! Club Shop : The Club Shop will be open before and after the game as usual! The final batch of bespoke 2018/19 home shirts are being snapped up so be sure to drop in to pick up yours – once they’re gone, they’re gone!